Despite Nashville’s economic growth, its residents, as in other booming cities, continue to have uneven access to nutritious and affordable foods. 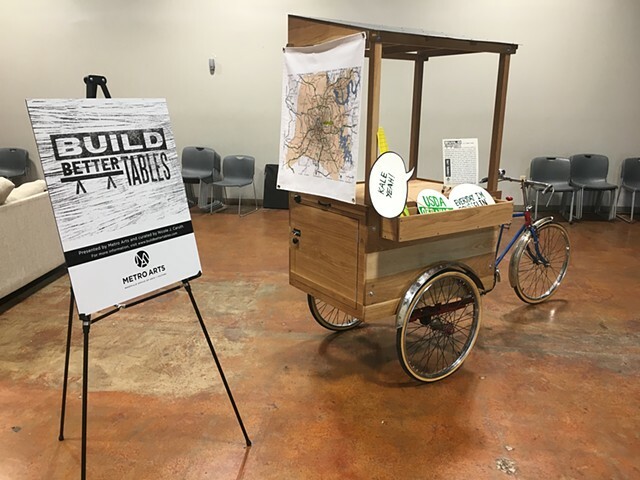 Juan William Chávez calls attention to food-access problems through his project, Food Rights Bike. The artist has repurposed a bicycle rickshaw that he inherited from his grandfather and transformed it into a mobile sculpture for food distribution and education. The rickshaw passenger seat has been replaced with a farm stand for growing and carrying fresh produce. With a built-in, swing-out table, the sculpture also functions as an urban-garden workstation, a platform for cooking demonstrations or art and gardening workshops, and an iconic information hub at community events. The back of the sculpture features a canvas map of Nashville, to aid conversations about where food is located and who can reach it. Build Better Tables is curated by Nicole J. Caruth, an independent curator and writer based in Providence, RI.